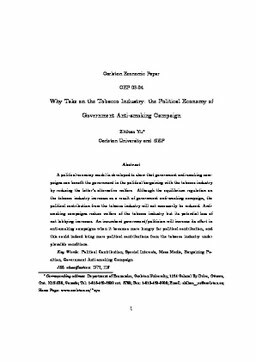 A political-economy model is developed to show that government anti-smoking campaigns can benefit the government in the political bargaining with the tobacco industry by reducing the latter’s alternative welfare. Although the equilibrium regulation on the tobacco industry increases as a result of government anti-smoking campaign, the political contribution from the tobacco industry will not necessarily be reduced. Antismoking campaigns reduce welfare of the tobacco industry but its potential loss of not lobbying increases. An incumbent government/politician will increase its effort in anti-smoking campaigns when it becomes more hungry for political contribution, and this could indeed bring more political contributions from the tobacco industry under plausible conditions. Yu, Z. (2003). Why Take on the Tobacco Industry: The Political Economy of Government Anti-smoking Campaign (No. CEP 03-04). Carleton Economic Papers (CEP). Department of Economics.